Perfect for accommodating families and entertaining parties, this reclining sectional sofa group has everything you need to great a classic yet relaxed atmosphere for all your guests. Framed by a one-arm reclining loveseat on its left and a one-arm chaise lounge on its right, this sectional has something everybody can enjoy. 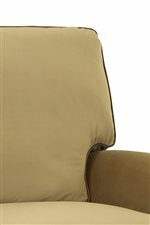 Whether sitting up and socializing or sprawling out and lounging, this combination item will give you the optimal comfort and support you need through its plush T-styled cushions, padded rolled arms, and upholstered footrests. Easily reclining to any angle of your choice, this sectional is made for your convenience after a long day on your feet. 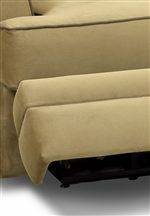 Upholstered in your choice of a variety of colors and fabrics, this sectional comes together with sleek welt cord trim all around, creating a unique two-toned design. Whether placed in your family room or home entertainment area, this sectional will be a family favorite. The Belleview Reclining Sectional with Left-Side Chaise by Klaussner at AHFA in the area. Product availability may vary. Contact us for the most current availability on this product. 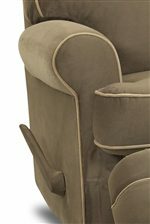 21302L CHASE Left-Arm-Facing Chaise Lounge 1 35" 63" 40"
21305 ALS Armless Loveseat 1 51" 39" 40"
21304 90SEW 90 Degree Seating Wedge 1 68" 42" 40"
21303R RLS Right-Arm-Facing Reclining Loveseat 1 55" 39" 40"
Recliner Mechanism "EZ Open," push-button mechanisms make it simple for any age to recline in style. Create the ultimate lounging environment with the Belleview collection of motion furniture. Designed with rolled arms and T-styled cushions, this collection exudes a classic style that is also casual and relaxed - just what you need for a wide-variety of occasions and locations within your home. Complete with a reclining sectional, sofa, chair, and loveseat (not shown), the Belleview collection is great for accommodating small or large family or social gatherings. With something everybody can enjoy, this collection is made for putting your feet up with easily reclining seats with padded footrests, as well as lengthy chaise lounges for laying back and sprawling out. 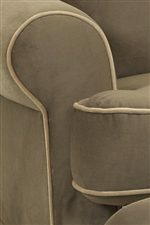 With sleek welt cord trim lining your choice of a selection of colors and fabrics, this collection creates a unique two-toned style that will add depth and dimension to any room. For the ultimate in lounging comfort and style, the Belleview collection is right for you. The Belleview collection is a great option if you are looking for Transitional furniture in the area. Browse other items in the Belleview collection from AHFA in the area.